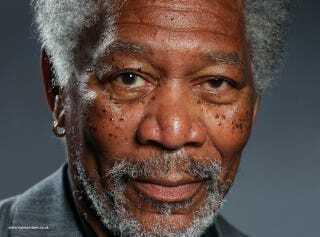 The latest Lambert creation is this jaw-dropping portrait of Morgan Freeman. You almost feel like you can reach out and touch his kind-looking face. It looks so good, it must be a fake, right? Makes those Hockney iPad paintings look a little silly doesn't it? Update (12/04/2013): Finally, some proof that this is real. Acknowledging Lambert's skill as an iPad painter, the makers of Procreate, the app the artist used for this Morgan Freeman painting, have confirmed that it's veracity. James Cuda, co-founder of Procreate, said in a press release, "The controversy prompted us to check the source file for ourselves, and after analysis we were able to verify that what we are seeing, is the real deal." I'm overwhelmed by the response to my finger painting video and happy that it has reached as many people as it has in such a short time. "One of the big reasons I wanted to paint this portrait was to create a video that entertained, inspired and educated people about digital art. I've met a number of artists who were motivated to start painting after seeing my previous videos. I've also heard several cases where teachers are using my videos to inspire their students. After using Procreate on my iPad (the app I created this portrait with) I realised that for the first time I could create a really highly detailed digital painting and have the whole process documented in a video. This was when I decided to start this painting. The process began with me blocking in the essential colours and shapes of the portrait and then reducing the brush size to add features and details. Each stage of the process took a step closer towards the painting becoming more realistic. To answer your question, no at no stage was the original photograph on my iPad or inside the Procreate app. Procreate documents the entire painting process, so even if I wanted to import a photo layer it would have shown in the video export from the app. The key to panting accurate detail at this obsessive level is to break down the portrait into much smaller paintings that are more achievable. Once you do that, the detail becomes easier to manage. However, the consequence of this is that the overall painting then takes a lot longer to complete. I trained as an oil painter and have been painting portraits and concept art using my Mac and iPad now for around 10 years now. Essentially, I've spent a lot of time learning how to paint realistic looking images. All I have done here is adapted my usual technique to work with my fingers instead of a stylus or brush. Other than the fact I am using my finger, the process of painting on the iPad is identical to all other digital mediums and in many ways similar to working with real paint. The whole point of the video is that the final image looks almost indistinguishable from the reference photo. If it didn't, then the claim of it being 'the world's most realistic finger painting' wouldn't really be a valid one.